Colwyn Bay is a relatively recent town, developing rapidly in the late 19th and early 20th century. Until the mid 20th century it was an important holiday destination. Before the late 19th century the land was fields and woods, with a few farms and cottages, and was owned by the Pwllycrochan Estate. 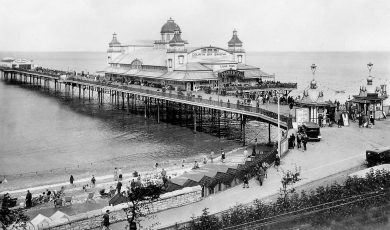 The development of the town was linked to the sale of the estate in 1865 and to the subsequent establishment of the Colwyn Bay and Pwllycrochan Estate Company in 1875. Being aware of the benefits of easy rail access from the urban areas of north west England, and the possibilities of developing a new fashionable resort, the Company sold off the land as building plots. What could be built on the plots was controlled by the Estate, with the former estate parkland being earmarked for the finest villas. By 1901 the town’s population had grown to 8,689.